This super-efficient, low maintenance home is a must see! The quality built home is located in the heart of Ashton, Idaho. This home has 8 inch walls and tons of insulation so it is cheap to heat in the winter and easy to keep nice and cool in the summer. This home is one level and wheel chair accessible. As you enter you will be greeted by the spacious living room and move right to the beautiful and simple kitchen which boasts custom built cabinets and Corian counter tops. There are two bedrooms with a bathroom and on the other end of the living room is the master bedroom and bath where you can enjoy the huge jetted tub. Three water heaters ensure you'll never run out of hot water, as well as, a water filtration system for fresh drinking water. The central vac will make keeping things tidy easy and the surround sound is awesome! The shop/garages 3 bays will give you more than enough room to store all your toys/vehicles/etc. One bay is tall enough to fit a fifth wheel! Smaller lot for low upkeep with established apple and plum trees with raised beds for planting and flowers. The estate is located near restaurants, shops, gas stations and more! If you want to go on a recreational adventure then hop in the car and head over to Henry’s Fork, Ashton Reservoir, Fall River, Warm River, Monkey Rock or, the Caribou-Targhee National Forest. There is a double-wide home on the back of the property (the lot has been split) that can be included for a rental with a total cost of $240,000 or just this property for $192,500. 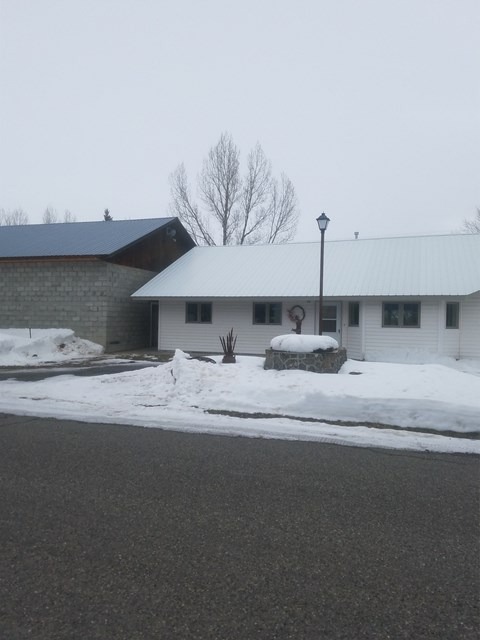 Call Jennifer Kunz today to see this awesome property before its gone 208-317-4722!